Nothing is more empowering or ego boosting than the feeling of a good pump. The Austrian Oak, Arnold Schwarzenegger, describes it as one of the greatest feelings you can achieve. Your muscles are thick and swollen, every vein on your body screams vascularity, and you feel like you need to turn sideways to walk though doors. The pump is motivating, inspiring, and always keeps you coming back for more. While we all know how the pump makes you feel psychologically…what does it actually do physiologically and how does it support muscle growth? From a scientific perspective the “pump”, commonly referred to as hyperemia, supplies working muscles with oxygen rich blood and nutrients while also removing waste products such as carbon dioxide. The more oxygenated blood and nutrients the muscles get the longer sustained contractions can take place…which ultimately leads to a pump and greater muscular growth. In fact, the cellular swelling that occurs with the pump may increase protein synthesis while also decreasing protein breakdown within the cell. This creates an optimal environment for muscle growth. If these two benefits of the pump were not enough, it also creates fascial stretching which gives the muscle more room to grow over time. Now that we know more about the physiological mechanisms behind the pump; how do we achieve it and more importantly how do we maximize it? The answers are through proper training and supplementation. From a weight lifting perspective you need to perform isolation exercises that target only one to two muscle groups at a time. Use heavy weights, higher reps, and minimize rest periods between sets. Over time though you may notice the pump does not occur as often as you like. This is where supplementation comes in. Most so called pump products promise skin tearing pumps…but fail to deliver. An ineffective combination of stimulants and under-dosed ingredients are usually the culprits that try to rob you of your precious muscle pumps. 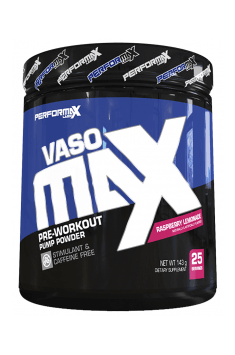 That is why Performax Labs created VasoMax…the most potent non-stim pump pre-workout on the market today with scientifically backed, efficaciously dosed, muscle pumping ingredients. Where others fall short of giving you the ultimate pump…VasoMax delivers! VasoMax starts by using Hydromax, that enhances plasma and intramuscular volume expansion. This hyper-hydration produces a full, hard muscular appearance that can also increase exercise performance. Next we added two research backed nitric oxide boosting ingredients; potassium nitrate and S-Nitrosogluthione. When these two compounds enter the body they are converted to nitrites which in turn stimulates nitric oxide pathways. This process vasodilates (enlarges) blood vessels and helps deliver more of the much need oxygen rich blood and nutrients to working muscles in order to achieve the pump and ultimately muscle growth. Because Performax is serious about providing you the best pump of your life we took the Vasomax formula one step further by adding two other pump proven, vasodilating ingredients…rutaecarpine and selaginella tamariscina extract (20% Amentoflavone). Unlike other ingredients that increase vasodilation through nitric oxide production; rutaecarpine promotes blood vessel dilation by altering calcium levels in the cells that form blood vessels. On the other hand, selaginella tamariscina is a very effective nitric oxide pump enhancer because it inhibits PDE, while blocking the metabolism of cAMP and cGMP. Last but not least, we know you sometimes need an extra dose of focus to push through a punishing workout in order to achieve your pump. That is why we added Alpha-GPC and Huperzine-A to Vasomax. Research shows these two powerhouse ingredients work synergistically to form and prevent the breakdown of acetylcholine…one of the most important neurotransmitters in the central nervous system responsible for enhancing cognition, focus, and muscular contractions. Your pumps are precious. You work hard and expect results. Don’t put your trust in a pump product that over promises and under delivers. Trust a product with research backed ingredients and efficacious dosing that delivers muscle engorging pumps time after time. Trust Vasomax! Dissolve once scoop of the product in 200-300 ml of water. Drink 30 minutes before training. After application, increase the intake of liquids to achieve best effects. It does not contain stimulants, so it may be taken relatively often without reducing sensitivity to the ingredients’ effects. You may temporarily add caffeine or coffee to achieve strongest effect of effort abilities support. PERFORMAX LABS is a Los Angeles based sports supplement company dedicated to providing a wide range of high quality products that help you achieve your fitness goals. Its principle is simple – developing products that give you all the results without any of the hype. Citric Acid, Natural and Artificial Flavors, Malic Acid, Sucralose, Acesulfam Potassium, FD&C Red #40. BCAA powder. It accelerates protein synthesis, reduces catabolism, and enhancing strength. Capsules with vitamin B12 which acts as a stimulator of protein synthesis. They increase appetite. Amino acid formula in a tablet form. Stimulates protein synthesis and improves recovery. Carbohydrate product increases muscle energy. It supports regenerative processes. The combination of glucosamine, hyaluronic acid and collagen. Facilitates regeneration of musculoskeletal system. Clean BCAA powder. It works anti-catabolic, and accelerates the regeneration of proteins. Glycerol (glycerine, 1,2,3-propanetriol) simplest tricarboxylic alcohol, used in the manufacture of medicines (as a filler), cosmetics and food industry. Used in higher doses affect water and electrolyte balance of the body, increase exercise capacity and extend the duration of exercise in various sports. In the sports supplementation used for hydration of the muscle cells to increase the volume of muscle during exercise. Glycerol (sugar alcohol) increases the ability to hydrate the phosphorus muscle cells, allows better nutrition and increasing the volume. It also has an impact on water and electrolyte balance and energy production. By oral ingestion does not change the glycemic profile of blood. It comes in the form of solid and liquid (glycerine), as mono-preparation supplement or an ingredient of pre- and post-workout supplements (creatine stacks nitrogen boosters). Dosage: 5-10 g per day dissolved in water, in the time before and after exercise. Beginning of application should be started on low doses and gradually reach the maximum, commonly used in sports supplementation dose. Rutaecarpine is an alkaloid of plant origin (isolated from the fruit Evodia rutacarpa, Chinese name Wu-Chu-Yu). Regulates nitric oxide, improves oxygenation of cells and tissues, causing vasodilation. It has diuretic properties, allowing for the excreting of excess fluid out of the body. A positive effect on the functioning of the nervous system, increasing the ability to concentrate, cognition and memory. In the sports supplementation used in the form of creatine stacks, no-boosters and fat burners, as a substance that enhances the activity of the other ingredients and supplements to improve the functioning of the nervous system. Alpha GPC (L-Alpha Glucerylphosphorylcholine, alphaglycerylphosphorylcholine) occurs naturally in the brain and milk. It is a chemical compound (a derivative of choline and its provider in the body) providing a precursor for the synthesis of acetylcholine, which is a neurotransmitter. Probably it has an impact on the secretion of the growth hormone that allows the intensification of tissue regeneration and it is improving the general condition and forming of proper body building. The medicine uses it in the neurological treatments (stress, depression). In the sports supplementation is rarely used. It is a part of the supplements supporting a night renewal process. Huperzine A - an alkaloid of plant origin having the ability to penetrate the blood-brain barrier, it is a negative catalyst for the degradation of acetylcholine, that improves nerve conduction and having a significant impact on the concentration, cognition and memory. It helps mitigate the effects of oxidative stress, and prevents the depressions, has neuroprotective actions improving well-being. In the sports supplementation it is recommended at pre-workout, pre-effort and during workouts in order to improve concentration, as an component of advanced creatine stack, no-boosters as well as herbal remedies that improve mood. Huperzia serrata - a plant family Huperziaceae occurring in the Far and Middle East. It is a source of huperzine A - an alkaloid having the ability to penetrate the blood-brain barrier, which is a negative catalyst for the degradation of acetylcholine, that improves nerve conduction and having a significant impact on the concentration, cognition and memory. It helps to mitigate the effects of oxidative stress, and prevents the depressions, has neuroprotective actions improving well-being.. In the sports supplementation it is recommended at pre-workout, pre-effort and during workouts in order to improve concentration, as an component of advanced creatine stack, no-boosters as well as herbal remedies that improve mood.